Dr. AJ Rolls (born Arthur James Crawford) has a diploma from the United States Department of Defense in behavioral science, a doctorate in metaphysical science, and a PhD in metaphysical science counseling. 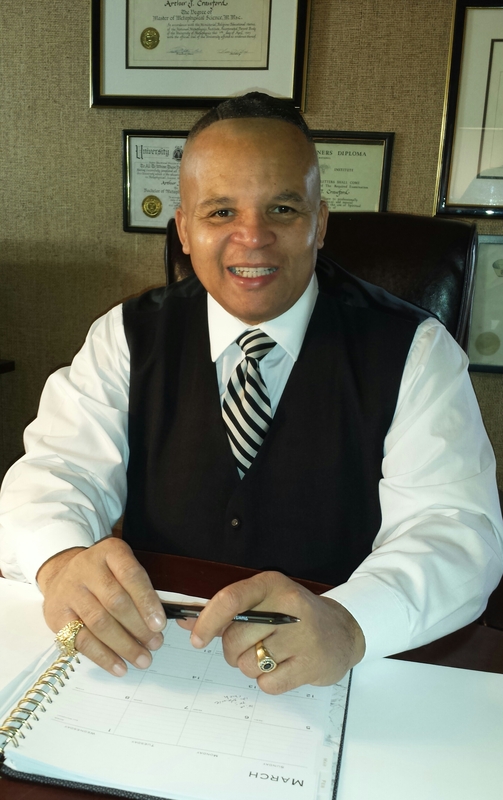 He is the founder and chairman of Right Choice Success Corporation and nine subsidiaries. AJ has worked in psychiatry, mental health, social work, and crisis intervention as a behavioral science specialist. He has worked in the New Jersey Maximum Security State Prison as a correction officer, the NJ State Senate, and the NJ State Assembly as a constituent liaison. 2016 he was appointed as Ambassador for the New Jersey 3rd United States Congressional District for the campaign of Congressional Democratic nominee choice. For forty years, he has researched success, prosperity, achievement, personal development, motivation, inspiration, positive thinking, millionaires, billionaires, winners, the subconscious mind, and metaphysical science, focusing on the Science of Success and Success Resurrection. He has produced his own movie on DVD. AJ Rolls was mentored by the work of Anthony Norvell who lectured at Carnegie Hall for twenty five years on power of the mind, financial success, and mysteries of the cosmos. Norvell’s clientele has included John Paul Getty, Conrad Hilton, Aristotle Onassis, a young Howard Hughes, and Clement Stone. AJ Rolls’ education included the curriculum of Dr. Paul Leon Masters, founder of the University of Sedona and the University of Metaphysics. AJ attended Chapman College, Monterey Peninsula College, correctional officer academy, behavioral science school, Rutgers University Entrepreneurial School, academy of health sciences, US Army Missile School, Air Force Community College, combat medic school, and drug and alcohol school. As a child, AJ Rolls overcame separation from his parents, along with poverty, welfare, shame, and physical abuse. As a teenager, he had numerous encounters with gangs, which contributed to him being jumped and severely beaten on four occasions and being shot at and stabbed. As a young adult, he experienced bankruptcy. He had an addiction to cigarettes, drugs, alcohol, and gambling. He suffered discrimination, legal problems, severe medical conditions, traumatic brain injury, posttraumatic stress disorder, being suicidal and homicidal. He lived in an abandoned home without heat during the winter and slept on the floor. AJ Rolls overcame all these obstacles and adversities in his life, which he attributes to God giving him the power to resurrect his life for success, which allows him to help other people resurrect success in their lives as well. His specialty in the success field is Resurrecting Success spiritually, mentally, emotionally, physically, and financially in the lives of those who have succumbed to misfortune and failure. He coined the phrase SUCCESS RESURRECTOR and created the Science of Success Resurrection Philosophy, formulated into systematic knowledge. AJ is a member of the American Metaphysical Doctors Association and the Prince Hall Masonic Fraternity. He has been married to Mary H. Crawford, for 30 years, and has five sons, one daughter and eight grandchildren. He is a US Air Force and US Army veteran. He is an ordained metaphysical reverend and maintains a close relationship with God. He resides in New Jersey.